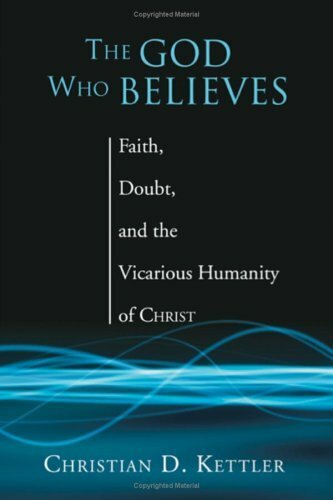 Final quotes from "The God Who Believes"
This post concludes a series reviewing Christian Kettler's book, The God Who Believes - Faith, Doubt, and the Vicarious Humanity of Christ. For other posts in the series, click a number: 1, 2, 3. We conclude now with several quotes from the book. "Jesus believes when I am unable to believe. Jesus acts when I am unable to act. Jesus loves when I am unable to love. Jesus forgives when I am unable to forgive. Jesus lives when I am dead in my sins. That is the power of truth become personal, the power of a vicarious life" (p. 102). "A vicarious life is a life that can be shared with others. The worship of the Father by the Son in the Spirit is but a part of a complete life of faith and obedience to the Father that in turn offers to us a share in this intimate communion between the Father by the Son in the Spirit. The Son indeed 'sanctifies' himself, sets himself apart for a holy use, for our sakes" [John 17:19 & Heb. 2:11] (p. 102). "The problem of humanity, and therefore of God's creation, is its corruption due to sin, resulting in death. The Father of Jesus, however is not afraid of the contradictions in his creation. The crazy quilt of our world of woe can bring us so easily to doubt and despair, but the Son knows the Father who has sent the Son to bear the contradiction on the cross. Since the Son is of one essence (homoousios) with the Father, this contradiction is now not alien to God's own being. God has made the problem of creation his own problem in sending the Son in the power of the Spirit. He has taken our place. Can we say then that the problem of evil and suffering in a world created by an all-powerful and loving God is no longer our problem? This is what Christ's vicarious faith proclaims" (p. 103). "The actions of Jesus are the foundations of our actions. Because he acts, we can act. This is no mere imitation, however. The free God has freed us through the free acts of the Son. Something has happened to us and in us...Since the actions of the Son continue through all eternity... we are not left to act on our own...Our union with Christ is too close...Belonging to him means that we can participate in his faith, the faith we have been unable to keep...'All of grace' does not mean nothing of man, but precisely the opposite: all of grace means all of man,' T.F. Torrance is fond of saying" (p. 112). "God's love for the world is vicarious, on our behalf, and in our place. The Spirit enables us to participate in the journey of the Son, in his faith, obedience, and love, so that we too might believe that God loves the world, including ourselves" (p. 126). "The faith of Jesus is included in the totality of his ministry. In a sense, his ministry is an accomplished deed. He has taught, healed, wrought miracles, was crucified, dead, buried, and was raised from the dead. This has already happened. 'It is finished!' is the cry from the cross (John 19:3). Yet a finished ministry is not one that is an an end. The Holy Spirit makes sure that the accomplished ministry of Jesus continues to be accomplished... The one who has accomplished the work is still alive. He still thinks of things today! as Ray Anderson quips... Jesus' life and ministry should not be viewed as a memory of a revered yet long-dead hero. The resurrection of Jesus and the gift of the Holy Spirit will not permit that" (pp. 144-5). "What God has done in Christ was not done by us, so there is nothing we can do to reverse these acts. Even in our misery of doubt, Jesus lives for us, Jesus believes for us... We wrestle with the goodness of God in what seems to be a less than good world. So it is very good to be with Jesus in the midst of our misery, rejection, and doubt. '...It is there that God Himself is good for us,' [Barth]. Here we find the care, the providence, of God; here is where we find that good which is good for us. God cares for us by sending Jesus. In his freedom God is free to care by becoming lowly and share in our misery... His freedom is found in taking upon [himself] our shame and curse, in interceding for us... Here is a lordship more powerful than a pure fiat: the power to take the place of humanity, taking the matter out of our hands and making our business his business" (pp. 155-6). 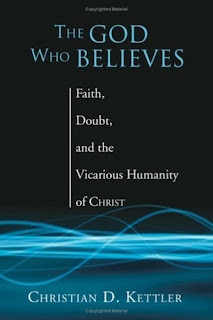 "[Lasting] faith is not entrusting ourselves to our own faith. That faith can fail... The alternative is the faith of the One who is unique... Herein Jesus demonstrates his lordship, a demonstration found in his exaltation, the exaltation in which we now share (Phil. 2:9-11). This has already happened. We are already in him, sharing in that which is foreign to our fallen state, fellowship with God. Integral to that fellowship is our participation in the obedience of the Son, an obedient movement we have not been able to make. Our existence has been 'anticipated and virtually accomplished in His'" (pp. 163-4). "Paul makes it very clear that we are all dead people, incapable of a response [to God] (Romans 6: Eph. 2:1). Anything else is a delusion... It is only because of Jesus' faith that we have forgiveness" (pp. 169-70). "In times of despair, anxiety, grief, and doubt, another person, the community, can be there for us. For the Christian, this is the vicarious humanity of Christ living through the Church, 'the community of the Last Adam' (1 Corinthians 15), a Body that is constantly judged by its Head. Here the Christian brother or sister can say to the one in doubt, 'Because Jesus believes when we cannot believe, let me believe for you right now.' As daring as this sounds, should we do less if the Church is truly the body of Christ and Christ is continuing his vicarious life and ministry through the Church?" (pp. 176-7). "Taking our place, our standards for God are not just filled out or improved upon, but replaced. The substitutionary reality of Christ is total: no part of our humanity is left untouched, including our religious attempts. Our restored faith consists only in admitting that something was done for us once and for all. Someone has believed for us once and for all. A genuine exchange... has taken place (2 Cor 5:19), including our faith for his faith" (p. 181). "If [Jesus] keeps the faith that we cannot keep, then this casts a question over a spirituality that centers in 'striving' to become spiritual 'athletes.' Jesus is not just a coach who instructs us how to train for spiritual fitness. A true vicarious mysticism of Christ begins with Jesus' spirituality, neither our piety nor our mystical strivings.... [Our] worship is being caught up in his response!... Here is true spirituality: casting ourselves upon Jesus our advocate, a Jesus who is truly human and who truly acts vicariously, on our behalf and in our place. Our spirituality is to allow God, 'to do what we cannot do and go where we need not go'" (pp. 184-5). "Even 'sanctification,' usually reserved for our human actions, has its source in Christ. Paul assumes the whole life of Christ as the essence of our Christian life: 'It is no longer I who live, but it is Christ who lives in me. And the life I now live in the flesh I live by the faith of the Son of God [subjective genitive, see KJV translation] who loved me and gave himself for me' (Gal 2:20). 'So if anyone is in Christ, there is a new creation: everything old has passed away; see, everything has become new!' 'Jesus Christ is our human response to God,' F.F. Torrance dares to say. To reply that this leaves no place for a human response refuses to take seriously the seriousness and desperation of our situation. We are helpless and lost, unloved or at least loved only conditionally in a hostile world of which we contribute through our own selfishness and desire to be God. Yes, we are called to faith and repentance, but never apart from the one response to God in the humanity of Jesus Christ" (p. 192). What a great way to start my day!This is yet again more powerful, mind-blowing and insightful Gospel! I like how Christian is putting it right "out there" in a "no holds barred" and clear way! I must purchase this book, and can't thank you enough for sharing some of its contents Ted! Appreciate all your good work and participation with Jesus in proclaiming His Gospel!